You might think we’re complaining because our App, Stealthy, went from 2nd place in the last two rewards cycles (Alpha and December) to 13th place in the recent January rewards. However, even the math in the App Mining white paper suggests that a drop this big should be improbable in a single review cycle (see: Step 4: Function F of the App Mining). There are serious problems with each of the App Mining Rewards program reviewers and the overall numbers. We shine a light on these issues below, hoping to make the App Mining Rewards system more than a gameable popularity contest plagued by incorrect incentive structures. Votes on Democracy Earth are supposed to be from a select group of individuals as described on p. 11 of the Blockstack Token White Paper (https://blockstack.com/tokenpaper.pdf). Unfortunately that’s not happening. All those ID’s belong to Dan Healy, the developer of Hermes Chat. One reason why Stealthy might have seen a reduction in the number of Democracy Earth votes (shown below) is that voters could not find it in the list of Apps to vote on. That’s because Stealthy appeared at the very bottom of a list of 46 apps so you had to scroll down for days if you were interested in casting a vote for it. Worse still, the list is lazy loaded, meaning that if you were smart enough to just search for Stealthy, you wouldn’t find it. Democracy Earth has indicated that the page order is randomized, but based on what trigger? In all of our uses of the page after keeping it open or closing it and reloading, Stealthy continues to be on the bottom. This means that Stealthy and possibly other Apps are effectively invisible, especially given the lazy loading behavior, requiring an inordinate amount of effort by voters. There’s also the unofficial way that @bodymindarts pointed out during the mining rewards alpha run, where you buy 90 votes for a bargain–$5: Some initial thoughts on the App Mining Program . This data shows that nobody is inspecting the mining results and checking to see if they make sense. It’s very strange that Blockstack would accept this data for an App that won their decentralized Chat Bounty), is featured in every Blockstack presentation, website, blog, fund, app.co, etc., and has been developed for 14 months? Stealthy is mobile first with a minimalist onboarding and login process–the testers were never directed to our website with links to our github, medium, twitter, news articles, FAQ’s and a variety of other information about what the app is. The users in our review videos didn’t understand anything about the app, Blockstack, decentralized technology, or blockchain. They were directed to the Android App store, where they ignored the description we had about our technology and skipped right into the App. Three of our eight testers complained of not being able to upload a file. We were baffled until we realized that the instructions below from TryMyUI had confused them–Stealthy does not have a file upload feature. The totality of the TryMyUI results calls into question their ability to properly evaluate communication Apps or understand what they are evaluating. None of the other communication apps are on mobile or feature push notifications–very strange for top performing communications tools. 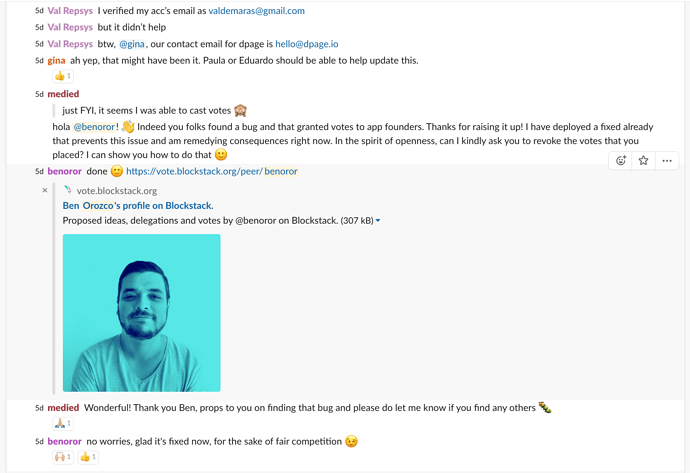 Clearly Blockstack needs to improve their process and attention to detail in the simple data entry and computation of the App Mining Rewards. The negative score currently assigned to Stealthy for January is averaged into future scores, affecting Stealthy’s ability to compete fairly, reclaim higher rankings, and fund our development. While there are many issues with these App Mining Rewards, at a minimum,we believe Stealthy should be re-reviewed by the Product Hunt and TryMyUI reviewers. 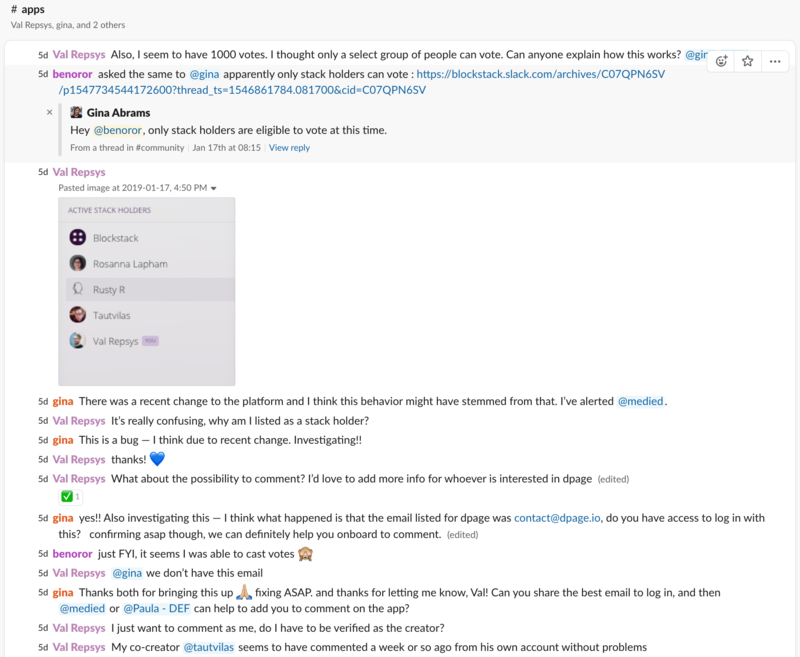 These re-reviews should, address the problems we’ve outlined: transparency, technical failures from Blockstack, poor instructions, and tester guidance. To date App Mining Rewards have heavily awarded two Apps that appeared 2 months ago (Zinc, SpringRole) that only use Blockstack Authentication. These Apps do not use the multitude of other Blockstack features, failing to push the platform further. How does this get Blockstack to the 1M users milestone or improve Blockstack’s storage, cryptography, and mobile platform features? The integrity of the Blockstack App Mining Rewards system is compromised. If we don’t address these critical issues and properly align the incentives for app developers, Blockstack will continue to lose great Apps that add value to the platform (like Misthos). Ultimately Blockstack could end up being a graveyard of crummy gambling Apps, like other platforms. Blockstack as a platform for app developers is only as good as the applications being built. Our goal since Day 1 has been to build a company around our product and help Blockstack towards the Milestone 2 goal. We’ve had to customize a lot of code to make a working, production-ready application. Others have had to do the same. Generally, we’ve been happy to do so because we knew Blockstack was supporting that. Unless things change with App Mining, we don’t see how we can feel supported enough to continue building on Blockstack. We want to work together to figure out a path forward that works for everyone. It appears that we failed to give fully accurate information behind the numbers used in the ranking process related to TryMyUI. The numbers used in the rankings are the ‘trimmed mean’, not the actual mean. They eliminated the highest and lowest scores to control for outliers, and then computed the mean from the middle 6 scores. They felt (and I personally agree) that this results in a more accurate figure. If you uncheck the top and bottom scores for your user list when viewing the ALF score, the numbers should add up to what you see in our spreadsheet. Obviously there is much more to comment about here, but I wanted to share this information first. I have thoughts on all of this, but that someone was able to vote for their own app and it counted is EXTREMELY problematic. I’m sure the fact that someone who shouldn’t vote was able to can be corrected via code and bug fixes on DE’s end. But the fact that Blockstack did not catch a completely fraudulent vote is not only disappointing personally but frightening from a company/mission perspective. I am proud of what Graphite has done and I’m happy with the results I’ve seen personally, but I cannot participate in something that can be gamed. I expect a response to this specific issue soon. Very soon. Yep, Democracy Earth made an upgrade to the platform that resulted in a bug which was quickly escalated and fixed (as in @benoror post). After the problem was fixed, all non-whitelisted votes were removed. We have verified the voters line by line several times , and can confirm that votes were only counted from whitelisted stack holders . Zero unverified or self-voting submissions made it to App Mining calculations. Thanks for the quick response @Gina! Are you suggesting that Dan Healy is a token holder? Or are you saying that the conclusions Prabhaav has drawn are incorrect? I see the 1000 votes from the user critic in the DE vote. As has been the case for everyone else on the platform (I think), that username is tied back to a Blockstack username. A quick search for that username, reveals the profile Prabhaav posted. That profile is part of a keychain that is owned by the Hermes app developer. I really hope I’m wrong. I hope Prabhaav is wrong. We can confirm that the only votes that were counted were associated with accounts of verified, whitelisted token holders. We can’t disclose the identities of these token holders. There may be a world where any developer can convince any token holder to vote a certain way. This will remain true as App Mining is decentralized further and token holders are just Stacks addresses with no identity information linked to them. You can’t practically enforce the alternative — where an entity is in the position of enforcing the “purity” of tokenholders’ votes. There are no easy solutions to this problem. However, the problem becomes smaller and smaller with more participation in App Mining from token holders. Also, you do not want me or Blockstack PBC to have the power to revoke/cancel a valid token holder’s vote in a decentralized system. There is an open community meeting around App Mining tomorrow and we should discuss these topics. P.S: I’ll comment on the other points shortly. First of all, your feedback is appreciated! Gaia integration being compulsory. Everyone agrees it should be there. It’s a question of timing and implementation. Let’s do it thoughtfully. Hermes appears buggy, and wouldn’t be surprised if most apps have bugs after they’ve passed initial review (e.g. works for some installations, not for others), a spot check of the TryMyUI video shows people successfully using the app. Maybe the app owner needs to update Blockstack.js to resolve the bug issue, and also needs to better maintain the app. There are more solutions and we should usher those in. 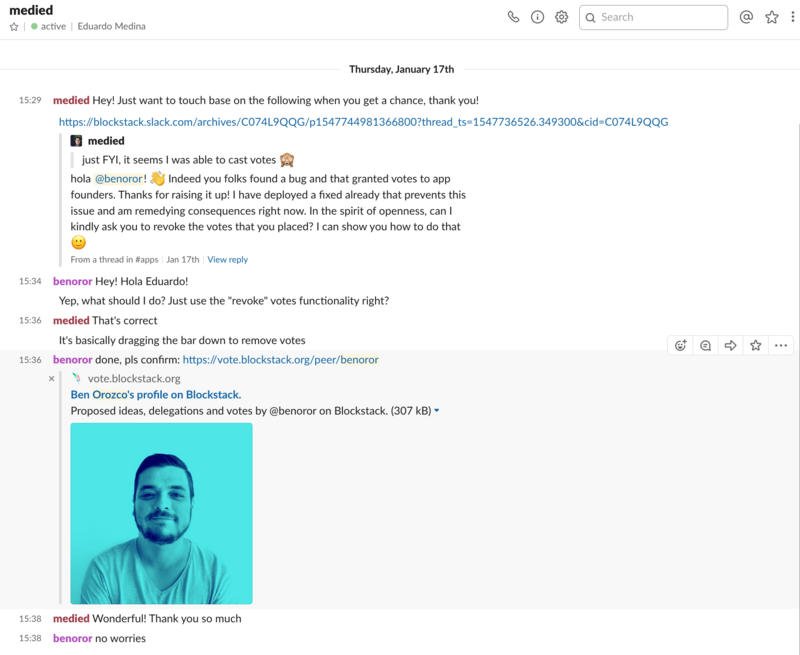 Product Hunt popularity contest: Let’s discuss this on the App Miner community call tomorrow, there are some potential solutions to proactively address this, however it has not been exploited to my knowledge. We want to work together to figure out a path forward that works for everyone as well. This is an ongoing experiment and are grateful for your feedback — its really helpful. I don’t mean to hijack all of Prabhaav’s points with this but I need someone to unequivocally tell me that “critic” the DE voter is not “critic.id”. No one has said that yet. Because those votes were absolutely counted and it’s a pretty odd coincidence that a voter gets allocated votes, drops all the votes on one app at the same time, and just so happens to have a DE username that matches a Blockstack ID of the developer that benefited from the vote. Justin, right on the same page with you. 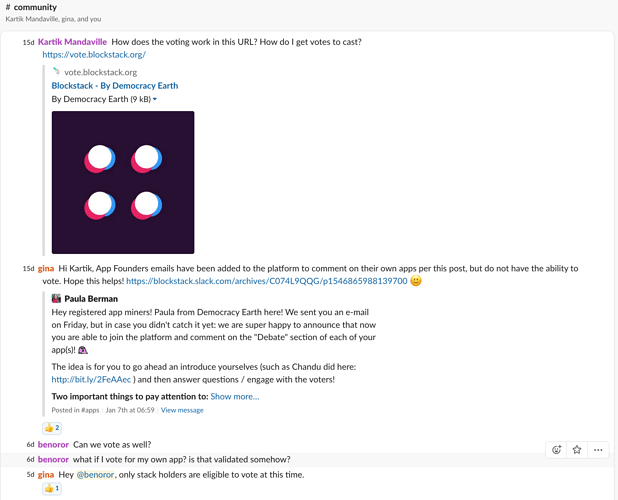 Here's what we know for a fact at this moment: The user "critic" on Democracy Earth is tied to an investor who has been fully KYC'd as a part of the token sale and is not the creator of the app that benefited from the votes (completely different person, name and all). The above being said, the user who signed in to Democracy Earth either logged in with critic.id (the beneficiary app creator) or changed their username to critic . After logging in they confirmed their email address as that of the KYC'd investor. These are the facts we know right now and are investigating further as to how this could have happened. The fact that TryMyUI users were given incorrect instructions and there were bugs related to Blockstack affected our PH scoring. What is the resolution for that? Are you asking us to carry forward a negative score due to no mistake on our part? I’m going to continue the conversation in the forum because A) I and others, I imagine, won’t be able to make the conference call, and B) it’s important that anyone be able to see this discussion. The problem with thoughtful consideration of how to introduce the Gaia storage requirement is that there are already apps on board that don’t use it. So you’ll put yourself in the position of telling those apps to add storage after the fact or grandfather them in. I struggle with this point a lot because part of the reason a handful of apps participated in the alpha run in October was to provide feedback to help this process going forward. I mentioned this back then. Others did as well. I eventually even wrote a forum post about it. Now we’re deep into apps making significant money without putting in the work to use Blockstack’s core feature. As much as decentralized identity is cool, it’s not Blockstack’s important feature. I’ve asked a few times about the progress toward Milestone 2’s goal of 1million users. If that goal is fueled by bringing on a bunch of apps that add Blockstack auth, I do not want to be part of that.